Doritos are definitely the go-to chips in our family; they are crunchy and perfectly seasoned, making them pretty irresistible. With this easy to make recipe, we turned one of our favorite snacks into a fun and flavorful casserole! 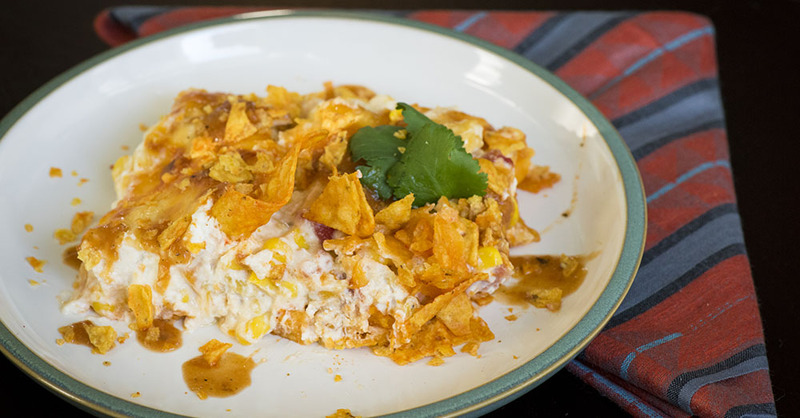 Between the sweet corn, cheesy chicken filling, and crunchy nacho-cheesy goodness, this dish has amazing texture, and zesty Tex-Mex flavor. Your family will be head over heals for this super simple supper…. And let’s be honest, who doesn’t want to have chips for dinner?! Crush 3/4 Doritos into small pieces and pour them into greased baking dish. In a separate bowl, mix together cream cheese and sour cream until combined, then stir in chicken, 1 cup cheese, chicken soup, diced tomatoes, corn and green chiles. Pour chicken veggie mixture over Doritos, then top with remaining cheese. Place in oven and bake for 20-25 minutes, or until cheese is melted and bubbly. Remove from oven and top with remaining Doritos.